Below is the scan of a May 29, 1863, letter from Private Albert Pancake, 80th Indiana Infantry, Company H, to his brother William Henry Harrison Pancake residing in Pike County, Indiana. By this time, Private Pancake has spent all eight months of his Civil War service defending Kentucky for the Union. The regiment has survived the devastation of the battle of Perryville; the long, cold winter of 1862-63; and is now a much smaller unit. 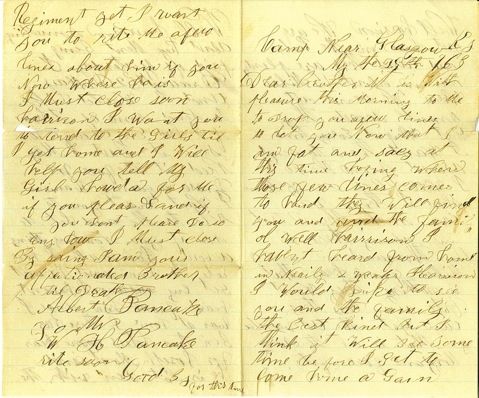 Pancake mentions three noteworthy events in this letter: the fact that the Rebels (in the form of CSA General John Hunt Morgan's Raiders) are nearby, the fact that he has just been paid $52 after going without his soldier's salary for four months, and that Albert, like any 20 year-old young man, has been spending some time thinking about the womenfolk back home, women who are increasing being snatched up by local anti-war Democrats or Kentucky refugees who have refused the uniform. This development infuriated Albert. This letter, like virtually all his letters, is written on one piece of paper which is folded longitudinally and scribed on both sides to give the appearance of four written pages. The first scan below is pages 1 & 4 (page 1 on the right hand side). The second scan is pages 2 & 3 (page 2 on the left). As you can see, there is no punctuation, no paragraphs, phonetic spelling, and inconsistent capitalization. All these characteristics are quite normal for a modestly educated Civil War soldier of the ranks. They also present a challenge to understand and transcribe. 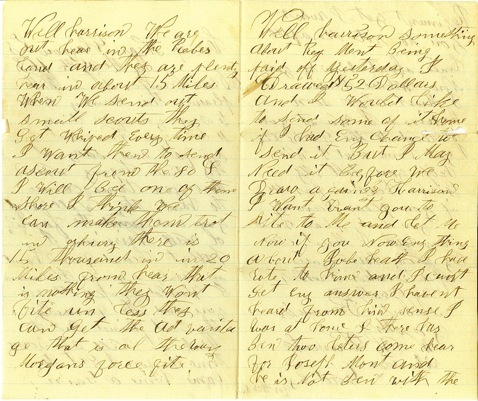 This is the second of many posts leading up to the publication of the complete archive of Civil War letters written by Private (eventually Sergeant) Pancake to his relatives in Pike County. My thanks to Tad Berlin for these materials and the permission to post them.